Australian band centred around song-writer Julie Montan, who make fragile-psych, oddball pop and now, with a full line-up, their take on personal-is-political post-punk. And they take advise from Louder Than War’s Ged Babey. But this song is one of the best of the year so far. First, there was Wasted … a song about Death, obsolescence and love… (and an) insidious, impenetrable slime of the mind. Then came Landline… a song about The lost joy of hearing the phone ring in the hallway, lounge room or kitchen, talking to our friends tethered to a wall, making prank calls on a Friday night sleepover… a lament to the landline telephone. And now this … their best song yet. I talk to Monty from Soft Rubbish a fair bit online. She sent me a collection of recordings of songs six months back, an intended album, asking for constructive feedback. Written and recorded over a couple of years, with different instrumentation and various helpers, It’s not an album, I told her, if anything its two EP’s, a lighter wispy one and a heavier one, with electric guitar and a full band line-up… It confirmed her own thoughts. There was one thing I was sure of though, that the track ‘Not In The Game’ was a stand-out, an absolute cracker of a song – and one with which the band could make its mark. It sounds like you’ve heard it before doesn’t it? The Passions? A hint of Siouxsie or early Altered Images? It’s one of those familiar but brand new songs which get their hooks in you straight away. It’s a post-punk, psych-pop meltdown, that encapsulates the growing sentiment of rage against late stage capitalism and it’s failings. We are here to speak truth to power. The world has gone mad, people have lost the plot and lost sight of priorities – me included. The song is a battle cry – to stop the world I want to get off! To stop the media barrage that is making me sicker every day. To be ‘Not In The Game’ means to step out of what other people say you should be, I’m talking about status, scenes, popularity contests etc – all these pigeon holes make me shudder. The “shadows on the wall” are not superlative – they are real. The imagery of flowers, ghosts, hearses and aliens is a beguiling mixture and the video makes things even more bizarre, with competitive dancing and silver-suited extra-terrestrials, but the ‘message’ or concept of the song hits home immediately as far as I’m concerned. There are many possible meanings and readings of this song. It has hidden stuff – like surrealist art – you can’t quite put your finger on what it means – neither Frida Kahlo nor I could tell you the exact meaning of the art because it’s something you have to work out for yourself. 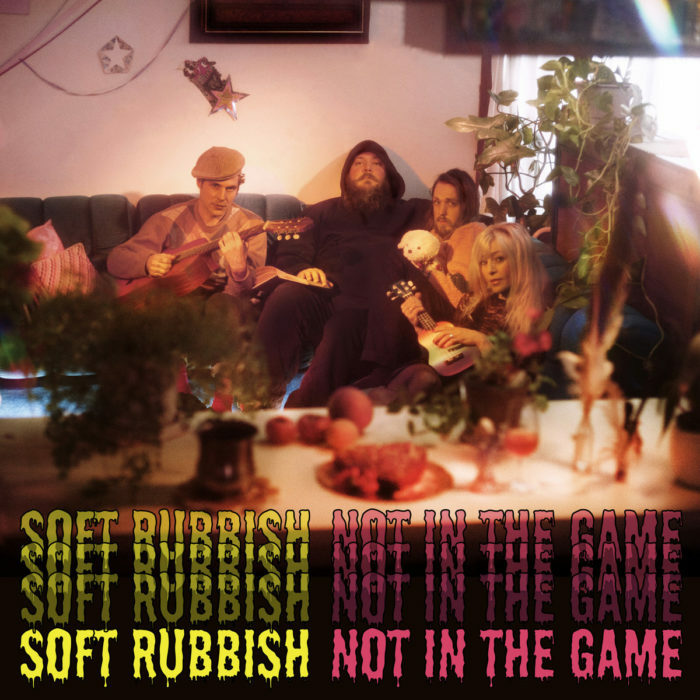 Soft Rubbish have had enough of games – they are out – they are not in the game. Another band already have the slogan Join Us -Be An Outsider- but they could loan it to Soft Rubbish maybe, as it fits perfectly. There can be no winners or losers if you’re not in the game. No greed or pressure. No fear or deceit. Imagine. All words by Ged Babey except where stated.